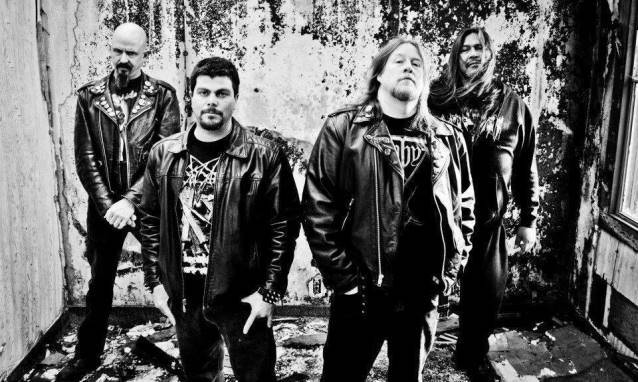 U.S. death metal legends AUTOPSY have completed work on their seventh studio album, "Tourniquets, Hacksaws And Graves", for an April 29 release via Peaceville Records (April 21 in Europe). The CD was recorded at Fantasy Studios with producer Adam Munoz, and sees a continuation of AUTOPSY's pursuit of the ultimate in metallic horror and extremity, featuring the longstanding combo of Eric Cutler and Danny Coralles on guitars, Joe Trevisano on bass and Chris Reifert on drums/vocals. From all-out death metal savagery to crawling, doom-filled sludgery, "Tourniquets, Hacksaws And Graves" further pushes the limits of taste and brutality with this latest relentless onslaught of terror from beyond the grave. Artwork comes courtesy of Wes Benscoter, who was also previously responsible for the stunning "Macabre Eternal" album cover. Says the band: "Tourniquets tighten... hacksaws rip... graves are filled...This is AUTOPSY, this is death metal. With the stench of 'The Headless Ritual' still permeating the befouled air, AUTOPSY has once again come for your very metal soul with their newest blood-soaked homage to all things dark, twisted and horrific... once again, bone-crushingly heavy nightmares await. 'Tourniquets, Hacksaws And Graves' will awaken the most depraved part of the coldest zombie's stare... blood will flow, brains will be destroyed, coffin lids will be opened." AUTOPSY's sixth studio opus of horror and all-out madness, "The Headless Ritual", was released in July 2013 via Peaceville Records. AUTOPSY released a DVD, "Born Undead", in June 2012 in the U.S. via Peaceville Records. The set charts AUTOPSY's birth, death and rebirth with an extensive documentary conducted with the bandmembers themselves, as they describe how the beast came to be, and the impact their music has had on the metal world over a span of more than 20 years. The film also documents the band's long-awaited return to the studio and stage, and includes rehearsal footage of both new tracks and old classics for their live comeback assault. AUTOPSY had previously decided to make an official comeback after working together on two songs for the special 20th-anniversary edition of debut album, "Severed Survival", in late 2008; the band having originally split before the release of its fourth album, "Shitfun", in 1995.